I actually made my first pumpkin dish last night and it was perfect timing because the weather went from 90 degrees to freezing. It’s insane. I’ve never had mesquite flour but it sounds just lovely! Mmm those muffs look amazing–I’ve always wanted to play around with mesquite flour. Need to order a bag soon! I SO wish I were visiting you right now so I could taste one for myself! I love illustrated recipes. They are so cute. Oooooh! What a great idea! I love love love the flavor of mesquite flour. It’s so unique, isn’t it? I’ve got a pretty big bag of it, so I’ll definitely try this, thanks so much! Interesting recipe….but mesquite flour is something I’ve never heard of before. The muffins look delicious. The top photo looks like beautiful sugar cookies! I always learn so much from your blog posts! I never heard of mesquite flour before. And, by the way, those muffins look beautiful. These look yummy! Would be great with coffee or a liter of ice cold fresh milk. thank you for this recipe! my sister recently gifted me with freshly milled mesquite flour from pods she collected herself from a tree in her yard, and since that makes such a great story, I’ve wanted to bake with it (obviously), but I haven’t had the vaguest clue where to start. Thanks again!!! Mmm that sugary top looks so good! I’m very curious to try various flours and mesquite is near the top of my list! You really have a way with words, Hannah…beautiful post! I’m with you on autumn’s near-arrival…although it’s my favorite season I’m still left wondering where summer went! These muffins are gorgeous. I’ve never heard of mesquite flour but I think I’d really enjoy it’s flavor…I will definitely look for it! I never realized you could make a flour out of mesquite. I am going to have to get some to try it. Thank you! How is it that I haven’t heard of Mesquite Flour. I know I’ve been baking long enough. Oh, the things I will do with this discovery! I totally need one of those muffins. ASAP! They look amazing & I love your muffin pan w/ the fancy circles. I tried your meringue recipe from the vida con cooking demo you gave & they came out perfectly. I made vanilla meringue cookies & put chocolate & coconut on the bottom. YUM! Thanks for doing the demo, now I need to get your book so I can make macarons. Mesquite and cacao? Yes, please! Ooh, I have been wanting to try mesquite for ages! Those muffins look perfect. Fun to find this post in my backlogged Google Reader. I coincidentally wrote about a mesquite flour cupcake just a few days after you. I totally agree that mesquite has a Fall feel to it. I love the flavor! Those muffins look perfect! That original hand drawn recipe is too cute! I would love to try these muffins as I’ve been curious about mesquite flour but so rarely see it. I think I saw it in a store once maybe. Just got some mesquite and excited to try lots of recipes with it! I’m from the UK and not sure what all purpose flour is? Is it white flour? Would the flavour of wholewheat flour be too strong with the mesquite? Yes, all purpose is just plain white flour. I wouldn’t recommend whole wheat since that flavor might compete a bit too much with the mesquite, as you figured. White whole wheat could work, however, if you have access to it. I just made this recipe, and it turned out AMAZING! I used 1/2 cup whole rye flour + 1/2 cup whole wheat bread flour + 2 Tbsp soy flour (instead of all-purpose flour), 1/4 cup maple syrup (instead of 3/4 cup sugar), soy milk instead of coffee, and 3 Tbsp canola oil (instead of 1/3 cup). They are moist, sweet, tasty, and have the perfect fluffy texture and a beautiful caramel colour. 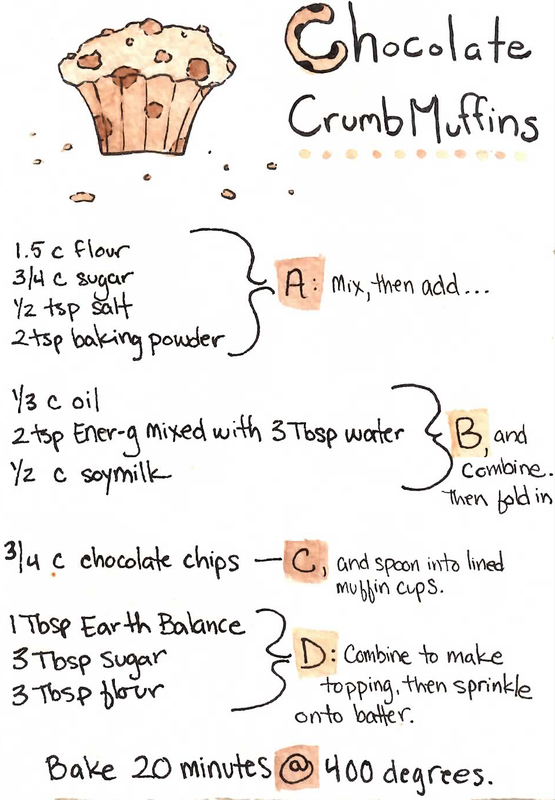 Thank you for an amazing and flexible muffin recipe. I would definitely make these again.